Say what? 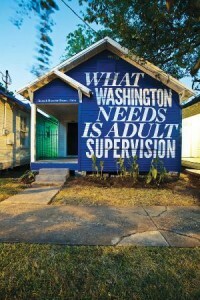 A shotgun-style house in Houston painted by artist/activist Rick Lowe. While provocative works may routinely fill the galleries at Moore College of Art and Design, their latest undertaking, Living As Form (The Nomadic Version) is certainly more complex than most. Perhaps the easiest way to wrap your head around the unprecedented, traveling exhibition is to think of it as the sum of two interconnected, customizable parts. The first part is an archive of 48 socially engaged projects produced over the last 20 years that blur the lines between art and everyday life. Originally selected by the New York-based nonprofit Creative Time in collaboration with Independent Curators International, Moore has culled 18 works from this archive, which are now on view inside the Paley Gallery in the form of photographs, posters and video footage, with several viewing stations set up throughout the gallery space. specific, socially engaged projects and events Moore has commissioned to essentially “activate” the show. This includes a series of informal conversations tackling an array of different themes relevant to the exhibition and Impossible Buildings & Contested Futures, a series of walking tours organized in partnership with Hidden City Philadelphia that explore Philly’s social, historical, political and physical landscapes.